Intravenous sedation is when a small needle is placed directly into your veins to administer medication that will reduce the level of discomfort that you may feel during an oral procedure. Many patients also opt for IV sedation if they have low pain tolerance or are anxious about undergoing a dental surgery or procedure. With IV sedation, you will be given a safe dose of pain-relieving medication that will make you virtually unaware of your dental procedure. At Staten Island Oral & Maxillofacial Surgery, we prioritize your health and well-being above all else. We strive to provide unmatched patient care using the most innovative technology while reducing any discomfort you may feel before, during, or after your dental procedure. IV sedation may be right for you if you have a fear of dentists or dental procedures. IV sedation can help calm your anxieties and fears before and during oral surgery. IV sedation may also be right for you if you have complicated dental problems that will require a lengthier procedure. Will placing the IV hurt? We use an ultrafine needle when administering IV sedation, so most patients only feel a slight pricking sensation when the needle is being placed. Prior to administering IV sedation, we will thoroughly clean the site where the needle will be administered. We also apply a topical anesthetic to reduce the pinching sensation when the needle is placed. It is possible that you may experience some bruising or discomfort at the injection site, but these symptoms will quickly fade in the days following your dental procedure. Am I allowed to drive after IV sedation? No, you must have a friend or family member accompany you home after your dental procedure using IV sedation. You may feel unsteady or groggy after receiving IV sedation, and you will be unable to drive a car or operate machinery until the sedation medicine has completely left your system. It is important to also have a friend or family with you for the first few hours after arriving home, as you may need support or help while the medication is still in your system. Can I eat before receiving IV sedation? We generally suggest that you do not eat or drink anything the day of your dental procedure. If your appointment is late in the afternoon, you may be allowed to eat earlier in the day. It is important not to eat or drink anything within six hours of your dental procedure. Our oral surgeons can discuss with you your specific food and drink limitations prior to your dental procedure. What should I wear to my dental procedure if I am receiving IV sedation? It is important that you wear comfortable, loose-fitting clothing to your dental procedure. We ask that you do not wear form-fitting clothing or jewelry. We advise that you dress in layers to maximize your comfort during your procedure. You should also come to your appointment with no makeup, creams, or lotions on. You should wear clothing that is easy to walk in, as your balance and ability to walk may be temporarily hindered following your dental procedure due to IV sedation. Are there side effects to IV sedation? The most common reaction to IV sedation is feeling fatigued, drowsy, or unsteady. You may experience difficulty walking in a straight line or talking clearly. This is a normal reaction that your body may have in response to the sedative medications used in IV sedation. You will not be able to drive or operate machinery until all of the sedative medicine leaves your system. It is important to rest when you arrive home after your dental procedure. Many patients nap after receiving IV sedation and wake up feeling much more refreshed. 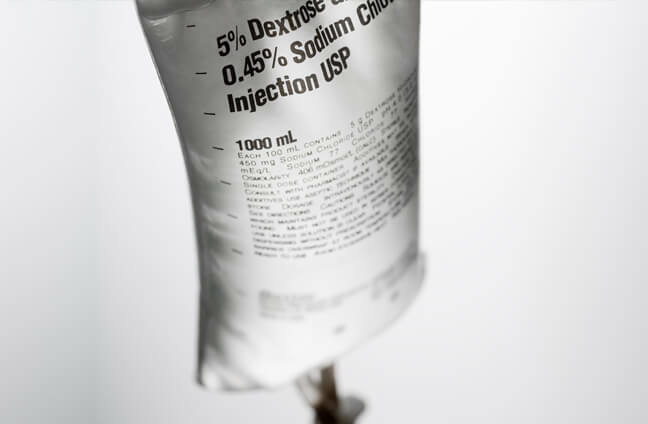 You may experience some bruising or discomfort where your IV was administered. These symptoms should quickly diminish after your oral surgery. What other anesthesia options do you offer? In addition to IV sedation, we also offer local anesthesia, nitrous oxide, and local anesthesia with oral premedication. Types of local anesthesia include Novocain and Lidocaine, which are used to temporarily reduce feeling and pain in a localized area. A local anesthesia is often utilized for a dental procedure such as simple teeth extractions or filling cavities. Local anesthesia reduces pain and makes for a more comfortable procedure without inducing sleep, as general anesthesia does. Nitrous oxide, commonly referred to as laughing gas, is a sedative agent that is combined with oxygen and administered through a mask that fits over your nose. Laughing gas is used because it can deeply relax a patient while not inducing sleep. During a dental procedure with laughing gas, you will be able to hear and respond to directions from our oral surgeons. Once the mask is removed after your dental procedure, the effects of laughing gas will dissipate within a few minutes. For patients who are anxious about a dental procedure or receiving a local anesthetic through a needle, our oral surgeons may prescribe an oral medication to take prior to your dental procedure. This oral medication in the form of a pill will help patients relax prior to receiving local anesthesia. How can I find out more about anesthesia options? For more information on anesthesia options, please contact Staten Island Oral & Maxillofacial Surgery to schedule an appointment with oral and maxillofacial surgeons David Hoffman, D.D.S., F.A.C.S., Lydia J. Lam, D.D.S., Steve Yusupov, D.D.S., M.D., and Mark Stein, D.D.S., M.D. at 718.226.1251.